Warnings: May irritate eyes. Keep out of reach of children. First aid treatment. Contains biodegradable surfactants (Anionic and Nonionic). If swallowed give a glassful of water or milk and call a poison control center or doctor. Do not induce vomiting. If in eyes, rinse well with water for 15 minutes. Additional Info: Septic safe, Not tested on animals. Made in the USA. Ingredients: Water, Alcohol ethoxylate, Triethanolamine, Linear Alkylaryl Sulfonate, Sodium Chloride. Does Not Contain: Perfumes, Dyes or Animal Ingredients. Suggested Use: HE Machines: Use 1/4 ounce or less (2 teaspoons) per load. Standard Machine: Use 1 ounce per load. 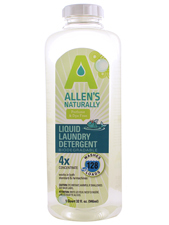 Cloth Diapers - Use 1/4 oz (2 teaspoons) in HE or Standard Machines.